The imminent defeat of ISIS in Iraq should see British drones grounded. But will they continue to launch strikes in what is becoming a perpetual war? This month (October 2017) marks ten years of British Reaper drone operations. Acquired on a temporary basis as an ‘Urgent Operational Capability’, the UK began operating armed drones in Afghanistan in October 2007 after having three delivered directly to Kandahar airport. A decade later the Reapers have been in continuous use and are now deemed a ‘core capability’. Having already tripled the number in service, the government are in the process of increasing the fleet up to 26 as the new, updated version of Reaper (re-branded by the British government as ‘Protector’) are delivered over the next two – three years. The UK’s commitment to the use of armed drones is clear, not only through expanding numbers in service, but also through increased funding for the development of more advanced drones, as well as the infrastructure needed to operate them. Less attention, however, is being paid to the impact of the growing use of these systems and the legal and ethical concerns raised. Over the past two years defence ministers have been responding to questions by insisting that the publication of a new policy document would address all such concerns. Repeatedly delayed, when it was finally published last month the document was underwhelming to say the least. To a large part it is mainly concerned with caricaturing the issues before then dismissing them. One part of the document, which states that it had become ‘UK practice’ to target suspected terrorists outside of the armed conflict, was dis-owned by MoD officials within days. This would perhaps be funny if it was not so serious. This failure to engage with policy concerns comes on top of concerted attempts to thwart oversight and accountability over UK drone operations. The refusal of ministers and officials to provide the security-cleared Intelligence and Security Committee with key information and documents about the drone targeted killing of Reyaad Khan is a scandal. As the Committee put it in their final report, “we cannot ourselves be sure – nor offer an assurance to Parliament or the public – that we have indeed been given the full facts surrounding” the killing of Khan. The refusal of the government to co-operate with its own oversight procedures in the extra-ordinary case of a targeted killing beyond the battlefield is startling. However, the government is also now refusing to provide basic details of regular deployment of its armed drones. It seems the secrecy surrounding the use of these systems is expanding with their growing use. This bodes ill for the future. But any discussion of the British use of armed drones however, cannot be done in isolation from US use. 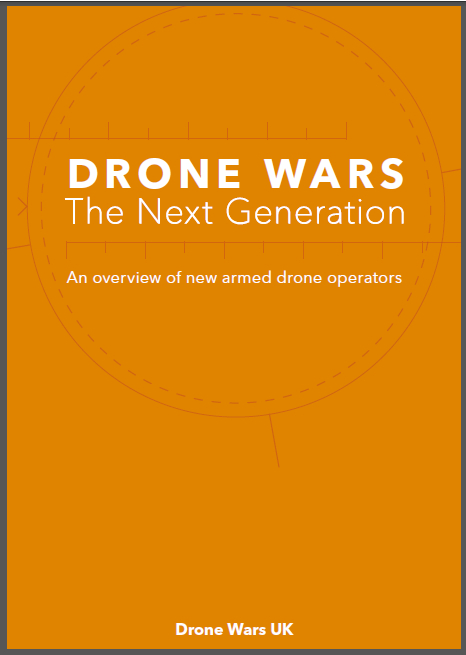 Over the past decade British armed drones have operated alongside and at times interchangeably, with the US drones operations. British and US drone strikes are ‘the sharp end’ of a combined data gathering machine operated by the British GCHQ and Defence Intelligence, as well as the US National Security Agency (NSA), CIA and a whole host of other secretive US agencies. Just last month, documents released from the Snowden cache revealed just how much a small British base, RAF Digby in Lincolnshire, located just a couple of miles from RAF Waddington, is involved in acquiring intelligence via the UK’s drones and sharing it with the United States. While there has long been international concern, not to say outrage, at the US use of drones for targeting killing in Pakistan, Yemen and elsewhere, the Trump administration is now considering policy changes which would increase these types of drone operations. Changes include expanding strikes from those who are said to pose a ‘continuing and imminent threat’ to the US, to those against ‘low-level’ militants, as well as pushing the authority for such strikes down the command chain to lower-level officials (remember this is for strikes in countries in which the US is not at war). In addition the US is also considering giving the CIA a greater role in undertaking strikes inside traditional armed conflicts, normally the preserve of the Pentagon. In the past government ministers have – publicly at least – sought to distance the UK from these US targeted killing operations, and disagreed with the US legal interpretation of a geographically boundless ’global war on terror’. However the drone killing of Reyaad Khan in 2015 and the UK Attorney General’s speech earlier this year adopting US legal interpretations for pre-emptive strikes shows that, for practical purposes the UK is hand-in-hand with Trump. However we are about to reach a fork in the road; an opportunity to make clear that the UK does not consider war to be a permanent state of affairs and to open up clear blue water between the UK and the US on this issue. As Iraqi forces continue to gain control over their territory, it is likely that Iraqi Prime Minister Haider al-Abadi will declare victory over ISIS in the next few months. 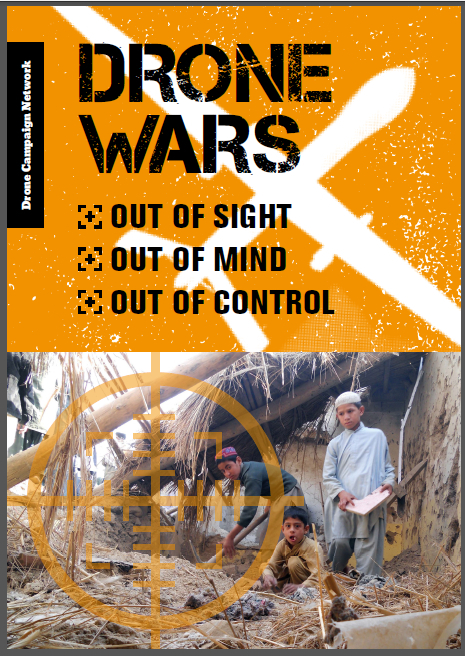 This will be a clear opportunity for the UK to call a halt to its decade of drone strikes. In 2014, Parliament dispatched its drones and other armed aircraft directly from Afghanistan to Iraq in response to a call for security assistance from Haider al-Abadi. In the UK parliamentary resolution authorising the deployment, MPs strictly limited the use of force to the territory of Iraq. However, within weeks British drones were ignoring this restriction and crossing the border into Syria, first to undertake intelligence gathering missions and then to strike. Later, this was regularized as parliament authorised strikes in Syria, but the international legal situation is very different with regard to strikes in Iraq and Syria. The use of lethal force in Iraq is at the request of the Iraqi authorities. This is not the case in Syria. Any legal argument for British strikes against ISIS in Syria is predicated on the threat to Iraq, (the so-called ‘unable and unwilling test’, which continues to be controversial). 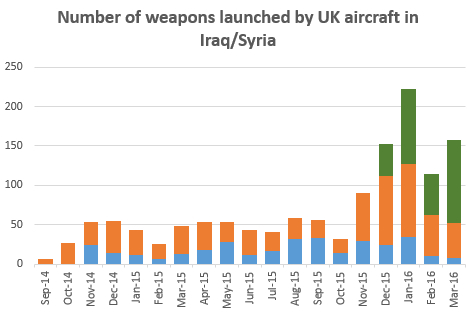 If the Iraq government says the war is over, this should be an end to UK air strikes both in Iraq and in Syria. There will be many siren voices insisting that the global war against terror goes on. Indeed, as the Telegraph reported this weekend, the Pentagon is already lobbying the UK to send its forces back to Afghanistan. These voices will no doubt increase after every awful terrorist act (‘Send in the Drones’). But this dangerous and unlawful call to perpetual war must be resisted. Dropping bombs and firing missiles does not and will not solve international security problems. Indeed, as many have stated, it has the opposite effect. Diplomatic and political solutions must come to the fore. Many politicians and military officials dismiss – and even express horror – at the idea that the UK is involved in a permanent war alongside the United States. But after seventeen years of military intervention and bombing – in Afghanistan, Iraq, Libya, Iraq (again) and Syria – unless we take a positive decision to choose a different path, war will have become a normal and permanent state.